"We've suffered with pests, fires, drought," Michael Honig said, adding, "We made it through Prohibition. This is a short-term setback"
Worried California vintners surveyed the damage to their vineyards and wineries Wednesday as wildfires sweep through counties whose famous names have become synonymous with fine food and drink. "We haven't been able to go up and assess the vine damage," said Katie Bundschu, vice president of sales. "We're in the process of salvaging what we can." 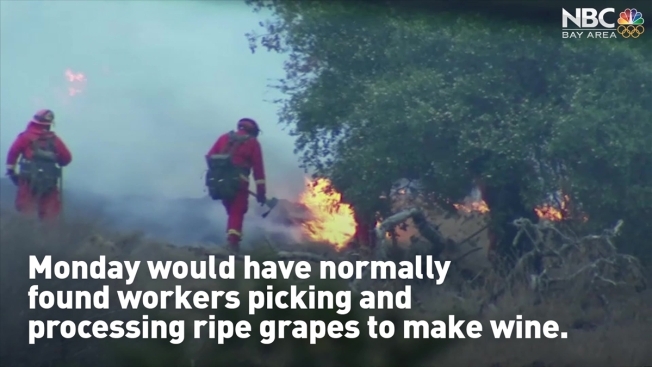 Speedy, wind-driven wildfires that continued to burn Wednesday came as workers in Napa and Sonoma counties were picking and processing ripe grapes to make chardonnay, merlot and other wines that have made the region a global hot spot. Millions of locals and out-of-staters flock to the counties every year to sample wine, sit in mud baths and soak in the region's natural beauty. At least five wineries belonging to members have had "complete losses" in facilities, with another nine reporting some damage, said Michael Honig, board chairman of the Napa Valley Vintners trade association and president of Honig Vineyard & Winery. He said the group has not heard from all members, especially those in the most vulnerable parts of the valley. "We don't have a good idea of how the vineyards have been impacted," he said. "The silver lining, if there is one to this fire, this situation, is that most of us have brought in 90 percent of our crop for 2017, so the vast majority of the crops have been picked." Most of the remaining fruit, he said, are thicker-skinned cabernet sauvignon grapes that won't be affected by smoke. Bundschu, a sixth-generation vintner, recounted a scary Monday night in which the flames licked at the perimeter of the winery but were beaten back by firefighters. A century-old redwood barn and her grandmother's 1919 home were spared. "The winery was in the path of the fire but escaped being engulfed by the flames. We have some damage to fix. The wine is secure in our cellars. We are cleaning up and hoping to have the power back on this week," it said. Spokeswoman Charlotte Milan said she could only confirm damage to the winery and a residence, explaining that workers had not been able to go on site. She said the estate's 2015 reds and 2016 whites were stored off-site. The Paradise Ridge Winery in Sonoma County posted Monday that it was "heartbroken" to announce that the facility had burned. She was optimistic that the fires will not affect the wines to come out of this year's harvest. Smoke would have to be heavy and sustained to do much damage and even then, she said, the harm would be limited to the fruit, not the vines or soil. That means next year's crop should be unharmed, Oberholster said. "We've suffered with pests, fires, drought," he said. "We made it through Prohibition. This is a short-term setback."